UPDATE—PINE MOUNTAIN CLUB, CA (July 30, 2018 at 3 p.m.)—Michael Dulle of Pine Mountain Club was charged with three felony counts, including attempted murder, arson of an inhabited structure, and possession of material or a device for arson. He is being held in Lerdo on a $600,000 bond. 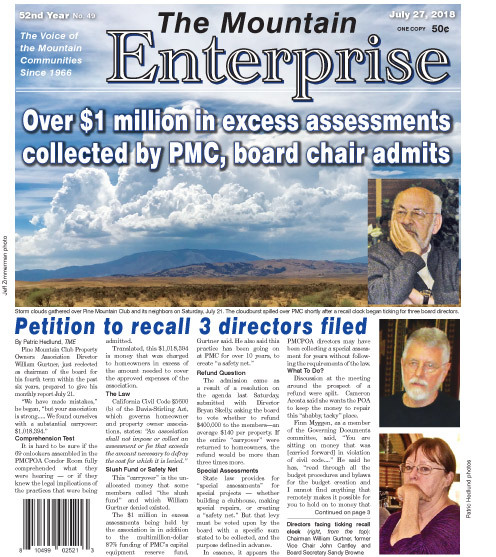 He will have a hearing on August 1 at 3 p.m. at Kern County Superior Court in Bakersfield, 1415 Truxtun Avenue, Division C. See full details in The Mountain Enterprise Thursday morning. UPDATE—PINE MOUNTAIN CLUB, CA (July 29, 2018 at 8 p.m.)—A disgruntled neighbor dispute over a barking dog turned into an arson event this evening on Freeman Drive (near Freeman Court) in Pine Mountain Club. The fire is out. Firefighters from Station 58 and Kern County deputies are on scene. An arson inspector has arrived and a man quietly presented himself to be arrested by a deputy. PINE MOUNTAIN CLUB, CA (Sunday, July 29, 2018 at 6:29 p.m.)—An arson suspect has reportedly been detained by Pine Mountain Club Patrol in relation to a house fire on Freeman Drive near Freeman Court. The fire has reportedly been contained.